A Chinese national living in Massachusetts has pleaded guilty to distributing illicit drugs shipped from China. Wang Bin, 43, pleaded guilty to 10 counts, including drug conspiracy, conspiracy to import a controlled substance, and drug distribution, according to a press release by the U.S. Department of Justice. Wang operated Cambridge Chemicals, Wonda Science, and other companies from a warehouse in Woburn, Massachusetts—fronts for his illegal drug distributing operation. The investigation leading to Wang’s arrest in August 2016 began when federal and Ohio law enforcement were looking into shipments of carfentanil, fentanyl, and other opioid drugs, after a series of fatal drug overdoses occurred in the state. 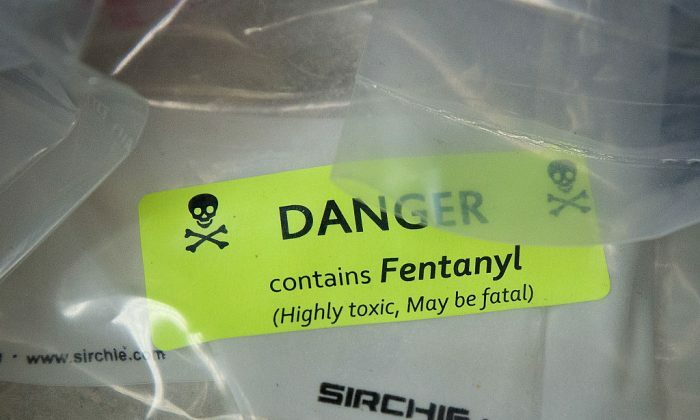 Fentanyl, originally developed as a painkiller and an anesthetic, is a drug that is about 50 to 100 times as potent as heroin, while carfentanil, used as an elephant tranquilizer, is considered 10,000 times more powerful than morphine. Most of the illicit fentanyl found in the United States is manufactured in China, and is responsible for the sharp increase in overall overdose deaths in 2016. In Akron, Ohio, for example, Thomas Nash and his son Vincent were found dead in February 2016 after a suspected overdose of fentanyl, which was traced back to China. The investigation eventually led law enforcement officials to several Chinese websites that were selling fentanyl and fentanyl analogs by the kilogram. One of the websites sold acetylfentanyl, a form of fentanyl, that led to overdose deaths of two residents in Summit County, Ohio. Beginning In November 2016, undercover agents started to buy drugs from a man identified as “Gordon Jin” in China. Jin would ship the orders to Wang, who in turn mailed the drugs to their buyers in the United States. According to court documents, there were numerous shipments from China to Wang between November 2016 to July 2017. Wang is scheduled to be sentenced on Nov. 13. The case is being prosecuted by Assistant U.S. Attorney Matthew J. Cronin. Fentanyl imports have especially impacted the country. Musician and singer Prince, who died in April 2016, was founded to have died from exceedingly high levels of fentanyl after a toxicology report from his autopsy was released in March this year. In June, customs officials at a Philadelphia port seized 100 pounds of fentanyl that originated from China. In October 2017, U.S. President Donald Trump declared that the spread of opioids, including fentanyl, was a public health emergency, and that the United States must stop the “flood of cheap and deadly” fentanyl manufactured in China from entering the country. The following month, Trump and Chinese leader Xi Jinping agreed that they would cooperate on counter-narcotics operations—with a special focus on fentanyl. According to statistics by the U.S. National Institute on Drug Abuse (NIDA), there were over 20,000 overdose deaths involving fentanyl and fentanyl analogs—out of a total of 64,000 drug overdose deaths in 2016.